Are Instagram & Snapchat stories the future of content marketing? Storytelling, specifically video storytelling, is the big thing when it comes to content marketing. For years now, video marketing - and video storytelling - has been heralded as the ‘future’ top format for content marketing – and now the future has arrived. Video, live video, and interactive video content formats have become a key component in any business’ content marketing strategy. Many businesses now include video in their content marketing strategy as a standard tactic to appeal to and engage prospects. HubSpot, a developer of inbound marketing and sales tools, indicates that video content will represent 74% of all internet traffic this year. The company has also highlighted that 87% of online marketers will use video content in 2017. In the past, when it came to choosing social channels for your business’ content marketing strategy in a B2B environment, the first two that typically stood out were Twitter and LinkedIn. The good news is that Twitter is still one of the best ways to amplify your business’ content and engage with your target audience, and LinkedIn still generates high-quality leads (particularly in B2B). But with all the noise online, it’s incredibly hard to stand out and capture the attention of prospects – as a result businesses are moving to new and more engaging formats across different channels. So here we are, entering another age of content marketing, where a new format will reign – and Snapchat and Instagram got it right some time ago. Welcome to the age of Stories. Video storytelling is the future of content marketing and a big hit! You know it's going to be successful when a social media behemoth like Facebook puts its weight behind it! Originally invented and pioneered by Snapchat, and later adopted by Instagram and Facebook, ‘Stories’ enable users to post a photo or video to their own Stories section or feed of their account, which is then visible to all their friends and connections, but only for 24 hours. These Stories can also include clickable links, allowing businesses to direct viewers to a specific page, product or piece of content. Also, businesses can '@mention’ someone in their Story, which is excellent for any business looking to engage with a wider audience. Stories are essentially the combination of an easily digestible format (video and visual) with a more personal and authentic approach (real-time and expressive), allowing users, brands and businesses to share their day with each other – and in turn, generate more meaningful interactions. You can’t deny the power of video content marketing through the stories format. There are over 150 million people using Snapchat, and on average, they spend about 25-30 minutes a day on it. Of those using it every day, 60% are also creating new, original content – this includes sharing personal videos with others and creating Stories. 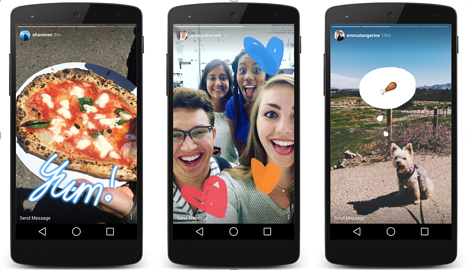 Facebook-owned Instagram Stories quickly followed suit, surpassing 100 million daily active users in just two months and boasting an active monthly user base of 500 million. Also, it’s used by 48.8% of brands – a figure that is expected to rise to 70.7% this calendar year. But aren’t Snapchat and Instagram only successful for B2C companies? Not exactly. While B2C organisations can use the platforms to interact with and sell directly to customers, B2B organisations can benefit as well – with the right approach! B2B organisations such as IBM have already got on-board with the Stories feature, using it to offer its audience a look inside the company’s facilities, culture and how and where its technology is being used. 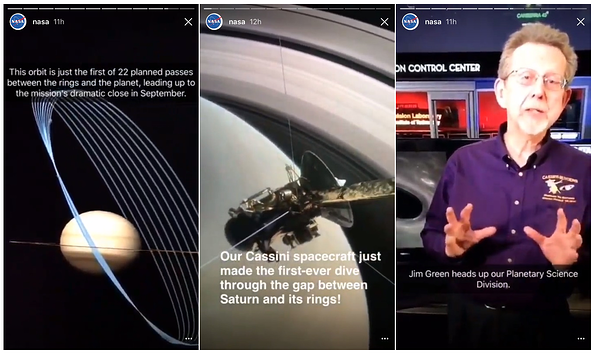 Similarly, NASA uses Instagram Stories to introduce employees and astronauts whilst showing off its cool tech and expertise. Slack, a cloud-based set of team collaboration tools and services, uses video storytelling in its video “So Yeah, We Tried Slack” to demonstrate how Sandwich used the product to solve the challenges of everyday workplace communication. In an almost case study-like approach, Slack’s video story regarding the way Sandwich is using the software is refreshing and appealing – and manages to convey a level of enthusiasm that could not be achieved with written content. Viewers quickly become invested in the video’s content and Slack easily portrays how its product has helped Sandwich to be more efficient and productive. While Slack’s use of the video storytelling format is slightly different, the effect is still the same. It allows the company to demonstrate its expertise and develop brand awareness for its product. How can B2B brands and businesses engage with their audience through Stories? In a world where engaging with prospects is increasingly challenging due to the amount of noise online, leveraging the latest content platforms and their features is an absolute necessity. It’s also important to appreciate that pretty much EVERYONE has a smartphone – and the likes of Facebook, Instagram, Snapchat, Twitter, LinkedIn and other social media channels are becoming the primary media for customer engagement. Across every marketing channel, success is defined by how well you can tailor your efforts to your audience and get them to engage. Your business’ buyer personas will help to both define the audience and refine the marketing effort. The examples above demonstrate how B2B brands and businesses have used video storytelling to drive a business goal, improve brand awareness, achieve customer engagement or demonstrate expertise to generate new business. 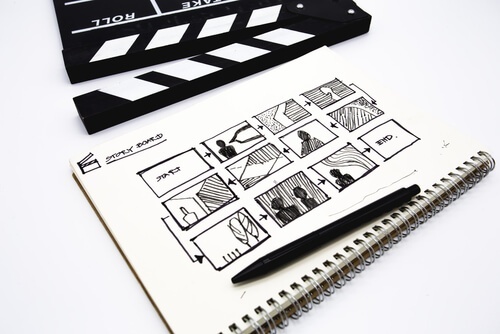 Video storytelling is a truly powerful medium when utilised correctly in the world of B2B - it gives prospects a real insight into your business and helps them to identify with the brand and the business. Start small and experiment. The idea is that you allocate a reasonable amount of your marketing spend to these channels; then measure and analyse the results so you can see what is and isn’t working. Once you identify the best channels that deliver results, you can start to replicate and scale up your activity. Try it. Measure it. Optimise it. 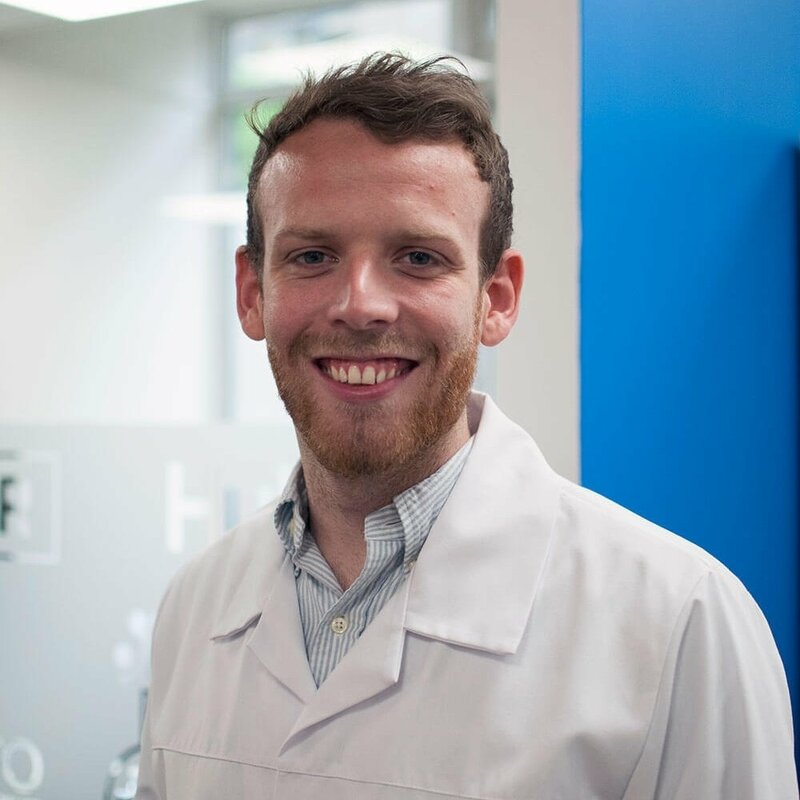 If you want to learn more about content marketing and how it can help your business to generate high-quality leads, download our free eBook: Content Creation for B2B Lead Generation.